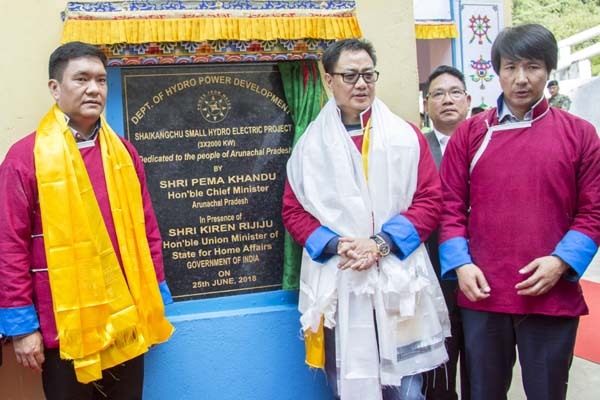 Chief Minister Pema Khandu in presence of MoS for Home Affairs Kiren Rijiju, RWD Parliamentary Secretary Jambey Tashi and MLA Tsering Tashi on Monday inaugurated the 6MW Shaikangchu Small Hydro Electric Project (SHEP) at Gongkhar village in Mukto constituency of the Tawang district. Tawang is almost 436 kms from here. The chief minister in his speech said the Shaikangchu SHEP is the biggest project undertaken by department of hydropower in the state and congratulated the officials for successfully completing the project. “The hydel will supply electricity to 27 villages around Mukto circle and power surplus generated will be supplied to Tawang headquarters,” said Khandu. He said the completion of Shaikangchu SHEP marks the culmination of an initiative that started in 2007 by former chief minister late Dorjee Khandu to make Tawang a power surplus district. “Tawang today has 14 numbers of hydel stations with total installed capacity of 11.41MW developed by hydropower department. With commissioning of Shaikangchu SHEP, the power generating capacity will be enhanced to 17.41MW,” said Khandu. The Chief Minister said the development of small hydroelectric project will benefit underdeveloped rural areas by improving their living condition and informed that Shaikangchu project will generated revenue of Rs 8 crore annually. MoS Rijiju also spoke on the occasion. Khandu on Tuesday laid the foundation stone for walk through market at Tawang. The project which is one of its kinds in Arunachal will be executed by PWD department at the sanctioned cost of about Rs 18 crore. The market concept was an idea brought by Khandu when he served as Tourism Minister. The project will consist facilities such as shopping complex, food court, public utility services, parking, pathways, illuminations, children’s park, amphitheater etc. Following laying of foundation stone, the Chief Minister inspected the site for development of the walk through market complex. Later Khandu inaugurated the office of the district medical officer and congratulated the medical department. He requested the department to be sincere in their duty and provide best service to the people. The inauguration was followed by inspection of the new building, office chambers, medicines stockpile including toilet facilities. The chief minister on the day also inaugurated the office of chief engineer, PWD, North West Zone and inspected the facilities in the building. The office is functioning from a temporary building and will be shifted to a new 3-acre area within the township. A 50 metre span built-up Girder bridge over Tawang-Chu river, which is also known as Gongkhar to Tengthen Bridge that will provide alternate connectivity between Tawang and Jang-Mukto constituencies was also inaugurated by Khandu. The RWD department executed the construction of the bridge at the cost of Rs 2.14 crore.